When it was announced in 2013, Quantum Break promised a unique experience using Kinect mix and match with the TV series. The Remedy Games really seemed ambitious, especially with the then newborn Xbox One console. Time passed, the Kinect was dropped by Microsoft, and Quantum Break developers opted for a more conventional gameplay. Thus, the title has been postponed to 2015 and, soon after, in 2016. The postponement of time, nevertheless, seemed to make the game well. Thanks to the premise of combining mystery game series with the Remedy managed to attract Hollywood actors to star in the project. Shawn Ashmore, Man X-Men Ice, Dominic Monaghan, Pippin of The Lord of the Rings, and Aidan Gillen, Pinky Game of Thrones, took the lead roles in the project. The plot revolves around two brothers who can manipulate time after mysterious event. When one of them is murdered by the villain, the other played by Ashmore, decides to act and possibly save the world in the process. The protagonist goes into fighting mixing shots, physical attacks and manipulation of time. In tests by the press in Gamescom , it was noticeable that there are two different kinds of powers to be used. Called time rush, one of them slows down time and allows you to move freely for a certain period. Thus, the character can better position during the conflict. The other power team dodge, makes the hero to move faster without being hit by enemies. In addition to these skills, the player can develop temporal explosions, protect themselves from bullets and stop time altogether. 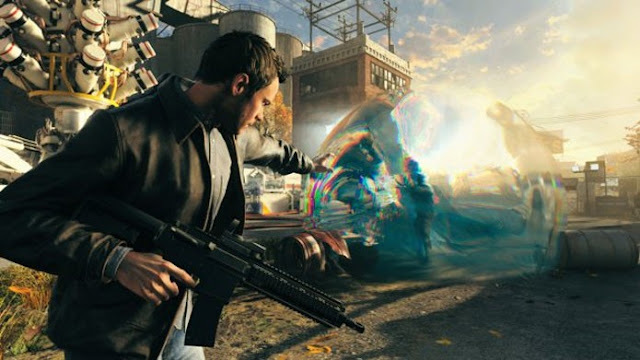 And one that attracted the most attention in Quantum Break was the idea of mixing television series with game. After much speculation, it is possible to understand what the developers plan. During the campaign, you control Jack Joyce (Shawn Ashmore). His enemy Paul Serene (Aidan Gillen) is a former colleague sent ahead, and returned older and different. He is leader of the Monarch company, focus of the episodes of the series. At the end of each act of the game, you now control the villain and should make a decision. This could change the course of history, which then will be counted in the series. Before each decision, the episode can be changed to different possibilities. To understand the full story of the title, you need to pay attention both on the show and in the game. Some events of episodes may appear without explanation, till all be explained during gambling. For those who wanted to watch the TV program without the game, Remedy decided to make two dependent media to tell the story in a unique way. The entire series will be released within the game, without the need to purchase it separately. Quantum Break is undoubtedly an ambitious project and if you can deliver what it promises, will be one of those exclusive titles that make the joy of the owners of a console and leave other curious. The game has scheduled for release for the Xbox One on April 5, 2016. With stellar cast, interesting gameplay and a unique narrative, the game deserves attention.